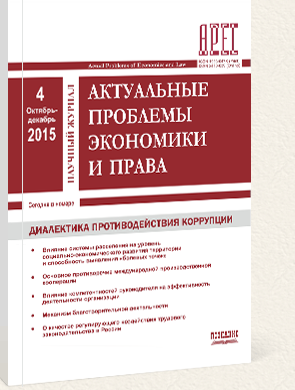 Federal reviewed journal “Actual Problems of Economics and Law” is the scientific and information-analytical journal in the sphere of economics and jurisprudence. The Journal invites all researchers in the most topical and promising spheres of Economics and Law. We welcome articles of interdisciplinary character, which view the topical issues in a comprehensive way. All articles are available at open access. Web-site of the Supreme Attestation Commission specifies the academic majors and corresponding branches of science. The academic journals in these branches are included into the List of reviewed academic editions, and it is in the listed journals that the results of Candidate and Doctoral theses must be published. On the 1. St of November 2018 the Journal Actual Problems of Economics and Law was included into ERIH PLUS international database (The European Reference Index for the Humanities and the Social Sciences), which is recognized as the most prestigious platform of academic editions in the sphere of Humanities and Social sciences in the European Union.